Céline Dogsé is studying Arts & Sciences at UCL, she spent one month interning with a social enterprise based in Indonesia. 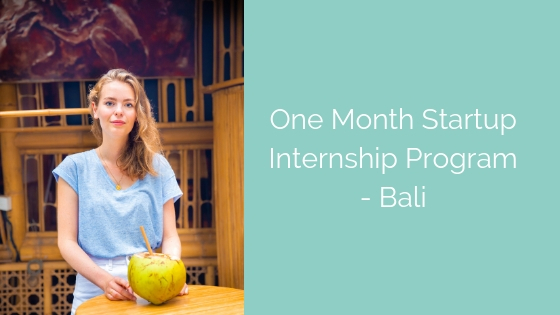 I decided to join the program and come to Bali because i wanted to see something new: to see something we don’t really hear about at university and to find out alternatives to the corporate world. I’ve been setting up an online shop for a social enterprise which is trying to reduce plastic waste in Bali (and the rest of the world) and it’s been challenging and fun. My project has involved planning how much inventory needs to be stored at any given time from which suppliers and making an online shop website. Right now, I’m trying to figure out the relative costs of shipping different products from Indonesia to various parts of the world. I didn’t know what to expect because it’s such an usual experience. I wasn’t expecting to meet so many people as I did and to get inspired by the energy in this place. Everyone always says oh it’s amazing and there’s so much energy and it’s great but actually being here and living it is different. In many jobs you get the impression that people are counting down to their lunch break but here you get the impression that many people enjoy what they do. So I like going to workshops, hearing what people are doing and what interests them. I think this experience will impact me definitely in the future when it comes to thinking about my career. My advice for anyone coming out to do the internship program is go talk to people. Try to get to know their story and be open to other people.